Used to have a Norton Commando (sigh). Purchased it used, eventually died of "multi-organ system failure"...i.e. too many expensive problems to fix. Not surprising, being a Norton! I biked both for commuting (short 10 mile commute) and just for the sheer freedom and pleasure of it. Year-round. Less pleasant on the bone-chilling cold & wet days, but biked nonetheless. The only shop I've spent any time in, talking with the owner, was Extreme Powersports on Rte 1 down near Fredericksburg. The owner seemed nice, very experienced, and passionate about motorcycling. Worst: the day I determined the Norton had turned over for the last time! What bike(s) do you ride? Triumph 955i Daytona. Where is your favorite place(s) to ride? Anywhere that has windy roads. Do you bike to commute? What's your experience like? Riding for over 30 years. What shops do you recommend (sales, service, new/used, accessories)? Triumph Fort Lauderdale.....ask for Megan. Your best/worst experience on a bike? ......160mph AWSOME! Sliding past a poice car on my arse with my bike following shouting "NOOOOOO!" damn that wet man hole cover! I ride a Victory V92, most of my rides are within the state, but a few over-nighters over the years. I really like rt 5 & 6, and colonial pwky. Taking rt 6 all the way out to afton and then hit the parkway up to rt 522 then back down to richmond is one of my "must" rides every year. Your best/worst experience on a bike? Traffic oblivious to bikes EVEN with direct EYE Contact in area. I am an newer rider still working on my skills so any riding time I can to improve. Where is your favorite place(s) to ride? I love to ride out in clifton, or out route 55 to linden and take some of the back roads along the river up there. Do you bike to commute? What's your experience like? I do...but i have a 4 mile commute, by the time i get all my gear on and off...I could've been in the office already in my car. Year-round or seasonal? I'd say 9-10 months out of the year, when we get any snow and all that sand and salt is on the road...its just yet another hazzard to be aware of on top of the terribad drivers. What shops do you recommend (sales, service, new/used, accessories)? I get my gear online and service my bikes myself...i love to tinker, and can't afford high labor prices at shops. I no longer live in Richmond VA but went to college around there and lived there for a few years. Where is your favorite place(s) to ride? Blue Ridge Parkway(beautiful in the fall) good twistys and scenic. Do you bike to commute? What's your experience like? Rarely. Not too fun for me, plus my bike is not condusive to running errands on the way home. What shops do you recommend (sales, service, new/used, accessories)? The shop I used to use closed down as well. Kind of sad. 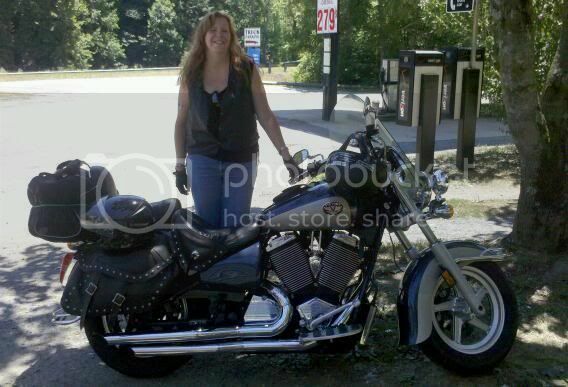 cant wait to get my harley in the spring, great posts, thanks! VTX 1800c. I like to take it out on 15 and the backroads when I have free time. When I used to ride Rt. 32 up near Harpers Ferry was a blast. Not a long road, but lots of elevation change. The whole area makes for a nice escape from NOVA. A few good roadside places to pull over too.